So I was gonna post this in my art thread like all the other Spider-Man related stuff I've been working on lately, but honestly... I'm at a loss to come up with anything coherent for this myself, and I could use some help. I've made no secret of the fact that I'm a huge fan of the Spectacular Spider-Man series. It's pretty much my go-to Spider-Man series, blending some of the best elements of the comics into a single series. However, one of the biggest changes the show made was to turn Montanna, leader of The Enforcers, into the show's Shocker. It gave Shocker some much needed character, and it's probably the only time I've seen him as anything but a Spider-Man punching bag. The designs were not great. They're both more or less generic tech suits, which lack the character of the more colorful designs of other major Spider-Man villains, particularly Shocker. As a result, they come across as more or less Shocker's sidekicks, rather than as part of a cohesive team. 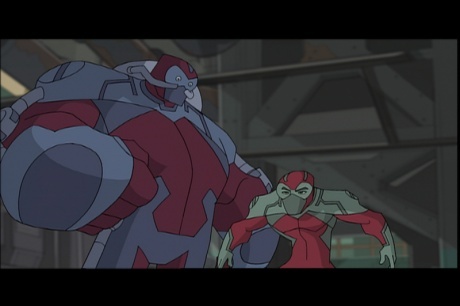 -I'm basing this on the Enforcers from the Spectacular Spider-Man show, not the 616 enforcers. Fancy Dan is Black, and Ox has a handlebar mustache. -I'm well aware the 616 Ricochet is a VERY different character than in Spectacular Spider-Man. I actually don't mind elements of his design being included (I actually like the notion of using Johnathon's color scheme on Dan's outfit, since dark blue/white would really pop) but I've been trying to keep the two designs unique. Also, not a fan of Leather Jackets over spandex. Other than that... go nuts. I'd prefer the designs be tech based to match their semi-origin in "Probable Cause," but by that same token Rhino's outfit is tech based, so don't feel obligated to match the techno theme of their awful outfits in spectacular. And don't think I'm giving up either. I'm still gonna be trying different things to see what sticks, but I would *really* appreciate someone coming at this from a fresh angle. This was my first pass at Ricochet. I'm not really thrilled with it, but I feel like it's a start, at least. I always felt Ox should have become Rhino in that show. That's an okay Ricochet. Personally I'd keep the discs on the arms that the original had. It adds something to the design. I agree with Pod on the disks, or give him some kind of arm-mounted ballistic weapon. Or at least something like Crackshot had in Liberty Project. Now for Ox. Honestly, this one came together much father than I thought it would... and I am so happy I got to keep the handlebar mustache in there. I might play with some more elements of this one, like knee pads and the color of the horns, but otherwise I'm kinda sold. Both of those are a big improvement over what they have the guy wearing in the illustration. He looks more like a fiddler crab (who was one of The Tick's enemies) than an ox.